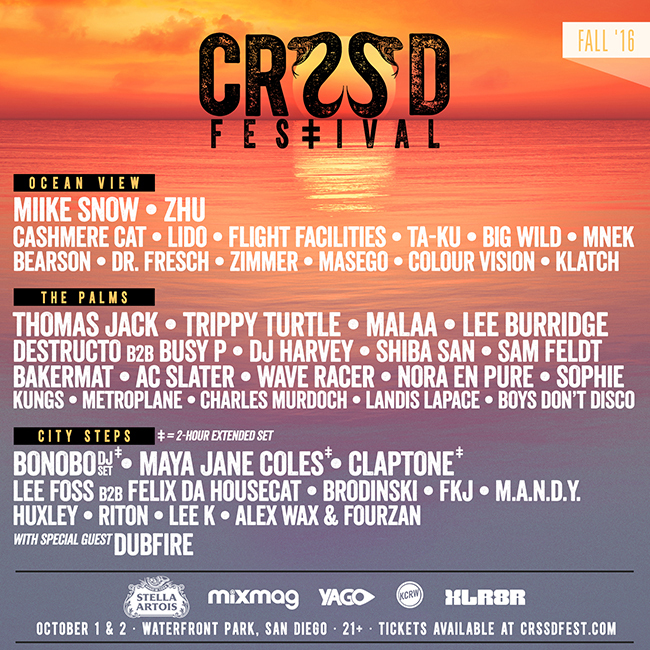 San Diego, CA – CRSSD Festival is one of the premiere festival events in southern California, offering a gorgeous water view backdrop surrounded by shooting fountains and swaying palm trees. This week, they've revealed the first phase of it's Fall 2016 lineup, which takes place on October 1-2. Fans can expect a full musical palette of killer performances from top name artists and leading underground house and techno acts like Miike Snow, ZHU, Bonobo, Maya Jane Coles, Thomas Jack, Trippy Turtle, Malaa, Lee Burridge, Cashmere Cat, Lido, Flight Facilities,Brodinski, DJ Harvey, Shiba San, and more.